Welcome to the depression and faith combining to help have a healthier attitude page. We know having faith when living with depression makes a major change. If you have faith it gives you the best chance to make a positive change in your life. When you battle depression it is often such a rough road that having faith is sometimes the difference of surviving or not. Our founder is a mental health advocate and author of the bestselling books titled Beating Bipolar, The Depression Diet, and Depression, Bipolar and Heroin. He nearly died from bipolar and depression in his teens. For two years he was in and out of the hospital and nearly did not recover. He found faith, therapy, medications and support groups helped him rebuilt his life. He asked God for a second chance and when given he worked to slowly and steadily rebuild his life.He now is a parent of two children, has a wonderful wife and has helped many facing depression. He’s also educated about these issues at many organizations and in the media. We want to help you develop your faith in dealing with depression. We do this by providing coaching through telephone, email, video chat and email. We’re the ones to motivate, encourage and help you develop a stronger faith. We want to help you develop a positive attitude to allow to work towards your goals. We’ll thank you by offering you one free 30 minute telephone session. You may use the above coupon and call us anytime. If you continue to work with us each week there is a cost and we offer many types of plans. Our goal is to motivate, encourage and inspire you. We thank you for coming to our website and are looking forward to helping you. 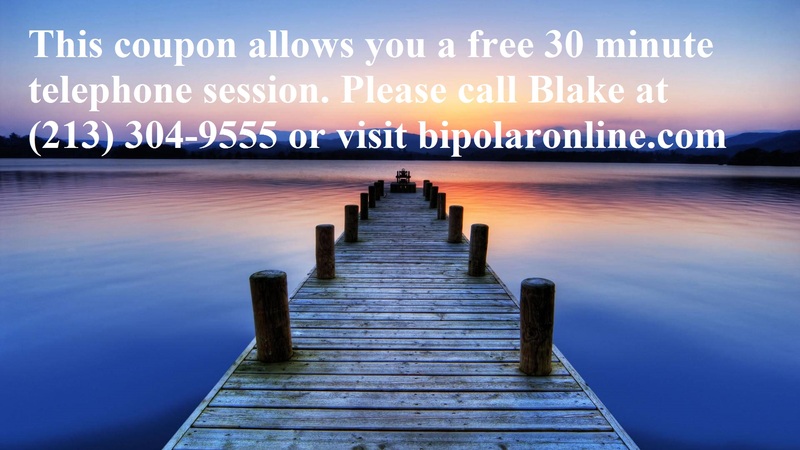 Please call Blake LeVine at (213) 304-9555 and obtain your free initial session today. We wish you the best and look forward to helping you work on your goals and faith.